No, not Pink Floyd's dark side, but Neil Young's. 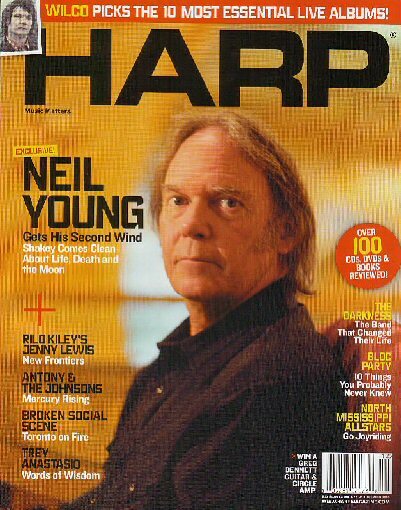 HARP Magazine's December issue has Neil Young on the cover (super portrait by photographer Danny Clinch) and an extensive interview by veteran rock reporter Jaan Uhelszki. The interview takes place immediately following the August concerts in Nashville. Uhelszki's thesis is that Neil has built his career by following the phases of the moon. With at least 28 Neil Young songs with "moon" in the lyrics, Uhelszki writes that Young began recording "Prairie Wind", filming the companion DVD and Farm Aid all under full moons. Last month, we reported that Neil was quoted in the interview saying: "There is another 'Hurricane' in me". "Okay, I'm kind of a walking contradiction," he laughs his characteristic short, two syllable laugh, that's somewhere between a chuckle and a cough." I just do what I feel like doing, so I don't close any door. And you know, because there's a reason for, to be open. I'm just open to things. I don't close things off, I don't have any, and I don't have a lot of beliefs that stop me from doing things. I'm sure I must have some but I don't, I try to be open and follow the muse wherever it goes. And if it's not around, I don't push it. There's no sense in trying to fan a flame if there's no flame. So, you know, sometimes you've got to rest. And you don't have to go against the grain." But the story gets even better when the journalist tags along with Neil and the band to a local Nashville bar to celebrate the concert filming's conclusion. The imagery of Neil at the bar, buying everybody rounds, nearly evokes the sense that it's just another neighborhood bar on just about any other night. A great vignette that sums up so much of Neil's music and life. In the end, Uhelszki who initially seemed intent on unearthing the dark side of Young, winds up discovering Neil's sunny side in one of the more enlightening profiles to come dancing across the moon beam in a long, long while.